From airplane wings to overhead powerlines to the giant blades of wind turbines, a buildup of ice can cause problems ranging from impaired performance all the way to catastrophic failure. But preventing that buildup usually requires energy-intensive heating systems or chemical sprays that are environmentally harmful. Now, MIT researchers have developed a completely passive, solar-powered way of combating ice buildup. The system is remarkably simple, based on a three-layered material that can be applied or even sprayed onto the surfaces to be treated. It collects solar radiation, converts it to heat and spreads that heat around so that the melting is not just confined to the areas exposed directly to the sunlight. And, once applied, it requires no further action or power source. It can even do its de-icing work at night, using artificial lighting. The new system is described in the journal Science Advances, in a paper by MIT associate professor of mechanical engineering Kripa Varanasi and postdocs Susmita Dash and Jolet de Ruiter. The usual de-icing sprays for aircraft and other applications use ethylene glycol, a chemical that is environmentally unfriendly. Airlines don’t like to use active heating, both for cost and safety reasons. 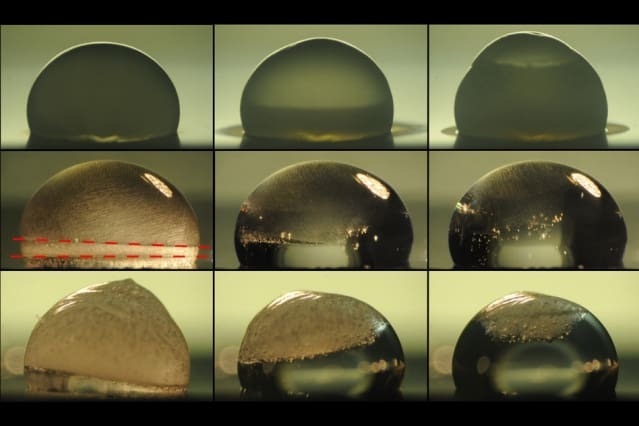 Varanasi and other researchers have investigated the use of superhydrophobic surfaces to prevent icing passively, but those coatings can be impaired by frost formation, which tends to fill the microscopic textures that give the surface its ice-shedding properties. As an alternate line of inquiry, Varanasi and his team considered the energy given off by the sun. They wanted to see, he says, whether “there is a way to capture that heat and use it in a passive approach.” They found that there was. It’s not necessary to produce enough heat to melt the bulk of the ice that forms, the team found. All that’s needed is for the boundary layer, right where the ice meets the surface, to melt enough to create a thin layer of water, which will make the surface slippery enough so any ice will just slide right off. This is what the team has achieved with the three-layered material they’ve developed. The top layer is an absorber, which traps incoming sunlight and converts it to heat. The material the team used is highly efficient, absorbing 95 percent of the incident sunlight, and losing only 3 percent to re-radiation, Varanasi says. In principle, that layer could in itself help to prevent frost formation, but with two limitations: It would only work in the areas directly in sunlight, and much of the heat would be lost back into the substrate material — the airplane wing or powerline, for example — and would not help with the de-icing. So, to compensate for the localization, the team added a spreader layer — a very thin layer of aluminum, just 400 micrometers thick, which is heated by the absorber layer above it and very efficiently spreads that heat out laterally to cover the entire surface. The material was selected to have “thermal response that is fast enough so that the heating takes place faster than the freezing,” Varanasi says. Finally, the bottom layer is simply foam insulation, to keep any of that heat from being wasted downward and keep it where it’s needed, at the surface. “In addition to passive de-icing, the photothermal trap stays at an elevated temperature, thus preventing ice build-up altogether,” Dash says. The three layers, all made of inexpensive commercially available material, are then bonded together, and can be bonded to the surface that needs to be protected. For some applications, the materials could instead be sprayed onto a surface, one layer at a time, the researchers say. The team carried out extensive tests, including real-world outdoor testing of the materials and detailed laboratory measurements, to prove the effectiveness of the system. “The use of photothermal absorbers is a smart idea and straightforward to implement,” says Manish Tiwari, a professor of nanoengineering at University College London, who was not associated with this research. “Scalability of these approaches and thinking about appropriate packaging, specific weight, etc., of the de-icing layer are important practical challenges going ahead, especially when it comes to the aerospace application. The paper also opens up intriguing possibilities around smart and flexible thermal packaging, and thermal metamaterials research to realize its full potential. Overall, an excellent step forward,” he says. The system could find even wider commercial uses, such as panels to prevent icing on roofs of homes, schools, and other buildings, Varanasi adds. The team is planning to continue work on the system, testing it for longevity and for optimal methods of application. But the basic system could essentially be applied almost immediately for some uses, especially stationary applications, he says.